A: Your insurance company will provide you with a claim number when you report your auto accident. If you need the phone number of your insurance claims department, Rick’s Auto body would be glad to assist you. Just call us at 401-781-8722. Q: How will I know if my car is a total loss? A: Your insurance company determines this by the actual cash value of your auto in ratio to the dollar amount of your repairs. Your insurance company will notify you if your vehicle is deemed a total loss, but please ask the experts at Rick’s Auto body. We have all the experience to repair just about any damage. Q: Can you match the color of my paint? 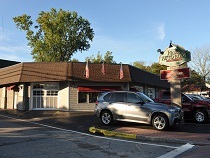 A: Rick’s Auto body uses a computerized color match system for a 100% guaranteed perfect match every time. Rick’s founder was the head painter at Providence Buick. He was well renowned for his skills and abilities with paint. He shared he insights and knowledge with his son, who today has passed them on to his son. Paint is what Ricks Auto Body knows very well. A: Repairs vary depending on the amount of damage. When you bring your vehicle in, someone will be glad to give you an estimate of the time it will take to repair your car. A: Rick’s Auto Body can have the rental car company meet you when you drop off your car. If you carry rental coverage on your policy your, rental can be direct billed to your insurance company. If you do not have rental coverage and were hit by another person, Rick’s Auto Body can assist you in trying to get the rental paid thru their company. Rick’s Auto Body also has complimentary loaner vehicles if a rental vehicle is not an option, subject to availability. Also, when your vehicle is finished you may leave your rental at our location. A rental agent will pick your rental up for you. A: Rick’s Auto Body would be glad to give you a ride home if you live in the general area. A: We will notify you a day in advance what time to expect your car back. If you would like updates more often during the repairs we can email throughout the process. A: Yes, there is a lifetime warranty on the repairs to your vehicle as long as you own the vehicle. Q: Is it true that I have the right to select the auto body shop to repair my vehicle? A: Yes. According to Rhode Island legislation, you have the legal right to choose the auto body repair facility. Your insurance company must work with them to repair your vehicle. As a Direct Repair Auto Collision Shop, Rick’s works closely with many insurance companies every week. Because we are always in contact with various estimators and adjustors, we know how to get your claim processed quickly and conveniently. Our I-CAR certified technicians along with our ASE certified analysts work expertly to repair your vehicle. We help you take the stress out of a very stressful time. Q: How can paint be eco-friendly? Combined with the use of Global Finishing Solutions down draft painting booth, emissions of airborne particles are mitigated, making the environment cleaner.